The Steamer - An American Icon from HubiePictures on Vimeo. Everyone stopped in their tracks at the sound of bells clanging and smoke billowing from the steam fire engine, with it's mighty horses thundering down the street and trusty Dalmatian racing alongside. That's how it was back when our American Steam Fire Engine responded to fires. Built in 1902 by the AMERICAN Fire Engine Company in Cincinnati, Ohio, this horse-drawn steam fire engine needed three large horses to pull its weight of over 9500 lbs. The traditional horse of the fire service is the Percheron, a draft horse originating in France. Colorful, powerful, and reliable, these gentle giants were easy to train and became devoted friends of the firefighters with whom they shared the fire station. Serving the City of Reno as Engine #1 for over 20 years, this famous fire engine saved many lives while protecting the city. Known as the classic in American firefighting, this steamer is a true example of American engineering and industrial ability of the early 1900's, and was a great step forward in early firefighting! After its retirement in 1922, Reno #1 served the Southern Pacific Railroad for a short period on firefighting trains protecting the snowsheds along the California Sierras. Lost in time for over 60 years, the steamer was found by the Hubert Family in 1990. In an old barn in Fallbrook, CA, Dave and Barbara Hubert stared at the rusted, incomplete remains of this "wonder of yesteryear" and knew they had to seize the chance and attempt to restore the steamer, all the time hoping against hope that, somehow, the boiler would still function after ninety plus years. So Dave, a retired fire captain, set out on a mission. After six years of searching for the many missing parts, fabricating the rest, and painstaking, restoration, including sending the huge wheels back to the Amish craftsmen to rebuild, it was finally time to paint the chassis and finalize all the gold leafing. Celebrating over 104 years of service, the horse drawn steam fire engine is finally fully restored to its original glory. 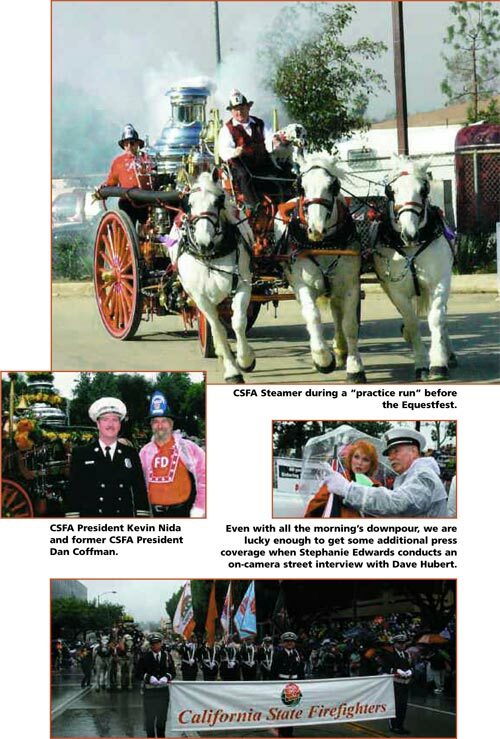 Today, as a salute to the California Fire Service, and known as the "CSFA Steamer Team" this colorful display can be seen traveling throughout the state attending community events, in the interest of fire prevention and life safety education. Miraculously, the boiler is still operational and back in action. A tribute to the craftsman of yesteryear, when fired up, this steam boiler can still pump 1000 GPM! This program is a perfect opportunity for any sponsor to get colorful exposure to huge audiences. This exciting and colorful display will serve as an excellent public relations tool, and can be partnered with a powerful advertising program. Learn More! DONATIONS - The CSFA Antique Steamer operates exclusively using donated funds. Please help us continue this amazing fire service tradition by clicking the donate button below.